If you look up into the sky on a clear night, you might see among the sparkling stars and planets an object that is moving slowly across the dark sky. That little light is no star; it's a satellite orbiting the earth. There are many out there, thanks in part to the efforts of John F. Kennedy and Lyndon Johnson. 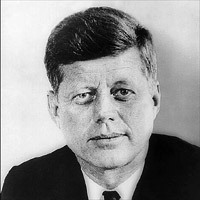 On June 24, 1961, the public learned of President Kennedy's letter assigning Vice President Johnson the high-priority task of unifying the United States satellite programs. After the Soviet Union launched Sputnik, the world's first artificial satellite, in 1957, the U.S. space program skyrocketed. But the program was plagued with rivalries between competing government agencies and expanding costs. It needed strong leadership.